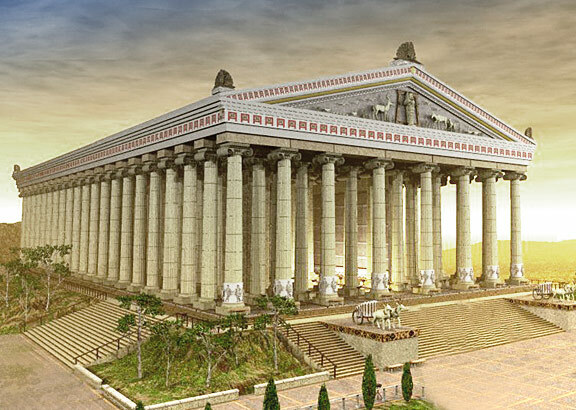 Long ago, 800 B.C to be exact, a great temple was born and that was the Temple of Artemis. This temple was a great site for honoring the goddess of fertility. Later that same goddess was a Greek goddess in charge of wild animals, wilderness, childbirth, and virginity. Her name was Artemis. She became one of the gods of Mount Olympus. Twelve Olympians are the major deities of the Greek pantheon, commonly considered to be Zeus, Hera, Poseidon, Demeter, Athena, Apollo, Artemis, Ares, Aphrodite, Hephaestus, Hermes, and either Hestia or Dionysus. Let's learn about the Temple of Artemis. Artemis was the daughter of Zeus and Leto and twin sister of Apollo. And Artemis was born before Apollo. She was a huntress, goddess of wildlife and patroness of hunters. It is believed that Orion was accidentally killed either by Artemis herself or by Gaia. She was known as Diana to the Romans. She was described most often as "the archer Goddess." The Temple of Artemis at Ephesus, also known as the Artemisium, was built to honor the Greek goddess Artemis, goddess of the moon and the hunt, by King Croesus of Lydia. The temple honored all three maiden goddesses of Olympus, Artemis, Athena and Hestia. This temple was built in Ephesus (an ancient city), which today is near the western coast of Turkey. The classic Ionic temple was designed and built by Cherisiphron, an architect from Crete, along with his son Metagenes. The location of the temple in Asia Minor was at a commercial crossroads, and therefore attracted a great variety of visitors, with varying religious beliefs. When the great temple built by Cherisiphron was destroyed by an arsonist, it was rebuilt of marble. The rebuilt temple was even more beautiful and became known as one of the seven wonders of the ancient world. Raphael C. Student, Katie B. Student "Lets Go Back In TIME to the Temple of Artemis by Raphael Cesaire and Katie Beasley" AwesomeStories.com. May 25, 2017. Apr 21, 2019.